What do you do when you produce more data than you can handle? This might seem like a strange question for experimental physicists, but it’s a problem that the ATLAS detector faces every day. While the LHC continues to produce ever-higher rates of proton collisions, the detector can only record data at a fixed rate. Therefore, tough choices must be made about what events to keep. This is not a decision made lightly – what if the thrown-away data contain some long-sought new particles beyond those of the Standard Model? To overcome this problem, the ATLAS collaboration has – for the first time – analysed data processed as the protons collided in real-time to search for new physics directly. This analysis has an unprecedented sensitivity to particles that otherwise may have been missed: low mass dijet resonances that could be linked to dark matter. Because of their huge production rate, only a small fraction of events containing low energy jets – sprays of collimated particles (hadrons) originating from quarks and gluons – can be kept for analysis. This limits searches looking for low mass particles that decay into a pair of jets (dijet resonances). One source of such resonances could be related to dark matter production. In LHC collisions, a new boson, which is a mediator to dark matter and a putative “dark sector”, could be produced and decay to two quarks – each forming a jet. This analysis has an unprecedented sensitivity to particles that otherwise may have been missed: low mass dijet resonances that could be linked to dark matter. The ATLAS detector uses a sophisticated system, the “trigger”, to decide in real time which events to keep. It accurately reconstructs jets, known as “trigger jets”, which typically are only used to determine if an event should be saved or rejected. But the reconstruction is so good, they can also be used to search for new physics! Since the amount of information needed to describe a jet is small, a huge number of events with only trigger jets can be saved that otherwise would have been rejected. The trigger jets are thus all that is needed to search for bumps in the dijet mass distribution. This spectrum is seen in the upper panel of Figure 1. The lower parts show the difference between the data and smooth functions fitted to them. A resonance would appear as a bump with a high statistical significance, as indicated on the figure by two (amplified) example new physics models taken from simulation. Since no significant bump-like deviations are observed in data, limits are set on certain new physics scenarios (see Figure 2) – which are now more tightly constrained than ever – and the hunt for dark matter continues. Search for low-mass dijet resonances using trigger-level jets with the ATLAS detector in proton-proton collisions at 13 TeV (ATLAS-EXOT-2016-20). The summary plots from the ATLAS Exotic physics group. 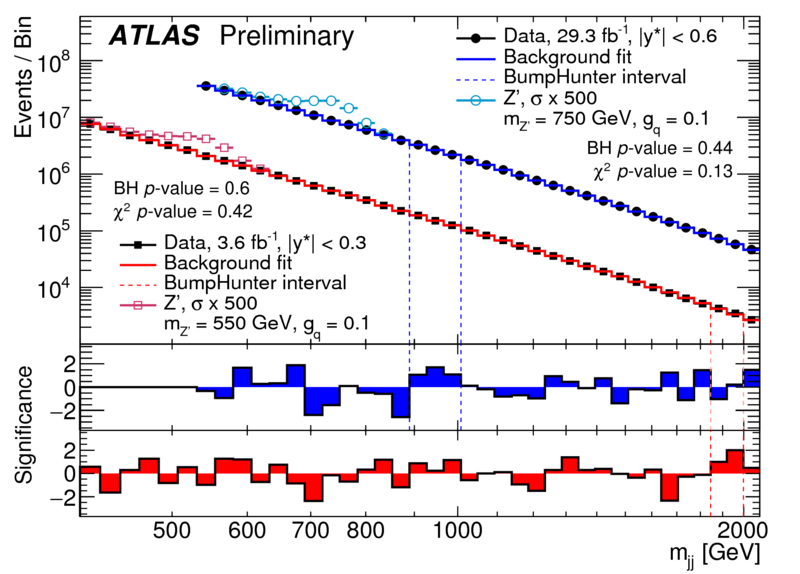 Search for new phenomena in dijet events using 37 fb−1 of pp collision data collected at 13 TeV with the ATLAS detector (a similar analysis, but with "normal" full events - Phys. Rev. D 96 (2017) 052004, arXiv: 1703.09127, see figures). See also LHCb and CMS publications that use this technique. LHCb: Tesla : an application for real-time data analysis in High Energy Physics (arXiv: 1604.05596) and CMS: Search for dijet resonances in proton–proton collisions at 13 TeV and constraints on dark matter and other models (arXiv: 1611.03568).